Twenty years ago R.E.M. 's Automatic For The People, Madonna's Erotica and the Manic Street Preachers' Generation Terrorists had all just been released; Sinead O'Connor was controversially tearing up photos of the pope on live television; and U2 were creating rock history in the U.S. with the outdoor leg of the Zoo TV tour. At the same time the Trabbies were lighting up stages across North America, a University of Washington student by the name of Rob Bakie was talking to some computer science students about starting an online newsgroup for U2. You might recognize it as http://www.inslab.uky.edu/MailingLists/u2-list.html, or Wire, the international mailing list that in 1992 changed the way the international U2 community communicated and connected. The only way for U2 fans to connect before Wire was via snail-mail addresses that were published in find-a-friend sections of fanzines. Music fans were among the first to embrace the Internet, and by 1992, according to Bakie in a 2011 interview for Meet Me In The Sound, there was "maybe something like 20 bands" that had mailing lists on the Internet. A U2 fan, he decided to set up what would become Wire, the first major online community for U2. Most online functions at the time were limited to email and some basic old-school chat rooms through Internet Relay Chat (IRC). This allowed "instant" connectivity that would take fans from photocopied pages to the personal computer, paving the way for the sophisticated online world we enjoy today. According to Bakie, the simplicity of this emailing system was one of Wire's strengths: "Do you have an email address? Yes. Then you too can talk about U2 online with other U2 fans." You could now "talk" directly to others on Wire and learn about their life and culture in a way that hadn't previously been possible. The bootleg market and ticket exchanges were transformed by these instant communications. While the fanzines offered similar services in the past, it might have taken weeks or months for these transfers to take place, and Wire reduced the process to days. Today we tend to take those instant communications and connections for granted, but at the time it was exciting to be a part of this revolutionary community. By 1999, 19 percent of American households were online. This growth was reflected around the world, and resulted in a membership explosion for Wire that coincided with the release of 1997's much-maligned ninth U2 studio album, Pop. While it's possible that Zooropa was the first album to be dissected in some format online, Pop was the first U2 album to be analyzed song-by-song, lyric-by-lyric, by a large, demographically diverse and truly international online fan community. Comments on @U2's forums suggest that my favorite U2 album still polarizes the broader fan community just like it did on Wire when it was released. The subsequent Popmart tour was also polarizing, with its kitsch aesthetic (a giant mirror ball lemon and an oversized cocktail stick) overshadowing some truly innovative production that included the world's (then) largest video screen. It was against this "why not a lemon" backdrop of possibilities that an army of fans with black and yellow dog tags and a 30-foot-long, 5-kilogram (11-pound) banner came to support their favorite band. During Popmart, online connections began to change the U2 concert-going experience. By the time of the L.A. Popmart gig in June 1997, Angie Imboden's Wire tags were already being worn by thousands of "Wirelings" as they followed the North American leg of the Popmart tour. These black and yellow laminated lanyards (shown above) were the result of an IRC discussion about how Wirelings could meet during the Popmart shows. Imboden and her father made more than 2,300 black and yellow Wire tags. At the time, Imboden was a teenager from Chicago, Ill., and in a 2009 interview told me, "All the stories that I have heard of people meeting up made it worthwhile." 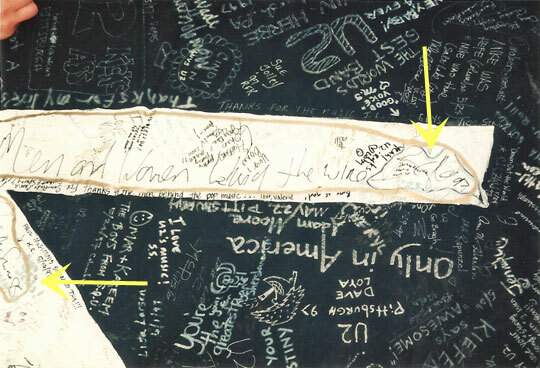 Imboden gave Bono his own Wire tag outside the band's hotel in Chicago, receiving a warm hug, and "the Wire tag girl" was eventually invited on stage during the Seattle show in December 1997. The Wire tags would remain in use, albeit no longer just for Wire but the entire online community, until the Elevation tour in 2001. The Los Angeles Times even acknowledged this aspect of the Wire community, describing U2 fans in 1997 as "being among the most ambitious in developing an extensive unofficial presence on the Web" and noting that that the "global nature of the online presence seen at the April 1997 Las Vegas Show was "remarkable." The Wire tags, the newspaper said, made the Wirelings look like part of the tour crew. Imboden, along with Mike and Karen Conway from New York State, was instrumental in developing a 30-foot-long black-and-white World Wide Wire banner. 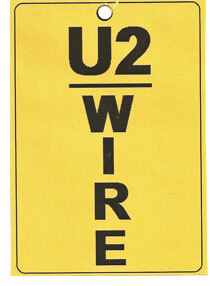 Affectionately known as the Wire banner, it was hung at stadiums around the world and became a beacon that allowed Wirelings to meet each other during the Popmart tour. The original idea started in an IRC chat room when the tour was announced, and a team of volunteers took to the idea with enthusiasm. Mike Conway said in a 1997 Hot Press interview that the aim of the banner was to "bring the folks of this list together, share our love for the band, and have something in the end which represents this love." The Conways traced the letters onto the black cloth using chalk, but rolling this large volume of material out on their living room floor was challenging in more ways than one. Karen Conway was pregnant with their first child, who would affectionately become known as "the Zoo Baby." Initially there were no concrete plans for the banner's role beyond the Las Vegas tour opener, but the idea soon progressed to take the banner -- which Mike Conway described in 2009 interview for Meet Me In The Sound as a "tangible testimonial to a virtual community" -- on the road with the band. Transporting the banner from show to show became a logistical challenge, and a team of Wirelings organized its transit around the world (it would fit inside a duffle bag) with help from Greenpeace and Principle Management. Mike and Karen Conway kept a database at their home in New York State tracking the movement of the banner to ensure it made its way to as many gigs on the tour as possible. The generosity of the people who took the banner on tour cannot be underestimated — it was all organized by email in a world long before smartphones, Wi-Fi and broadband, making the journey of the Wire banner around the world something even more magical in hindsight. The Wirelings were heartbroken by the loss of the banner, and Karen Conway still hopes that "maybe it will show up on eBay someday." A group of proactive members, led by the fundraising efforts of Heidi Dutton, decided to create a second banner. It was made with ballistic-strength black cloth donated by the father of @U2's Sherry Lawrence, who along with Donna and Dale Souza, Anna Hight, Dutton and others produced the "Wire - Not Coming Down" banner for the Australian, Japanese, South American and South African legs of the Popmart tour. It even made it to the Sarajevo show, a feat all the more remarkable given that Bosnia was a war zone at the time. Karen Conway notes that having the banner at the Sarajevo show was "the best tribute to U2," while Mike Conway recalls being moved by posts about the banner being in Sarajevo because of "the powerful message of unity we were trying to convey." They recall receiving messages about soldiers protecting the banner during the concert. The second banner made it to all except about four of those final Popmart dates, a remarkable achievement of perseverance and ambition. There was some online discussion about donating the Wire banner to the Rock and Roll Hall of Fame in Cleveland, Ohio, when Popmart ended, but nothing come of it, and the banner now lives in a cupboard at the home of Mike and Karen Conway. It's still dragged out of the closet for special occasions, smelling of vomit and showing its wear and tear. The number of signatures on it is a testimonial to the strength of the Wire community during the Popmart era. By the time Popmart ended in Johannesburg, South Africa, in 1998, U2 had played to almost four million people around the world during the 93-show, two-year run, a tour that was made even more special for those of us who were part of Wire at the time, meeting at shows and following the progress of the Wire banner as it made its way around the world, somehow tying us all together. Little did we know in 1998 that the same technology that had so successfully brought the members of Wire together for Popmart would two years later be the catalyst that tore the same community apart. When Joel Abbott's service provider crashed in September 2000, Wire also came to earth with a thud. A mailing list that had been distributed to more than 4,000 email addresses at its peak, and brought a fan community together in one place for almost a decade, began to fracture. Fans scattered throughout the cyber-world and the Wire era was over. In a 2005 interview for RTE Radio 1, U2.com director Sebastian Clayton spoke of how Wire was the inspiration for the official U2 website. He confirmed long-held suspicions among former Wirelings that "there was a ginormous U2 community online before we ever launched an official site. There was a mailing list called Wire; they used to email each other all the time, just a ginormous mailing list where all the fans used to keep in touch with each other. The band and I joined up to it just to see what was going on and how it worked and what happened and what people were saying. One can only imagine what Principle Management thought of the flame wars, the extent of the bootleg market, the feedback on the tour, and the disgust expressed about the (then) possibility of a greatest hits album. These sometimes flippant and usually friendly exchanges, however, didn't reveal the true spirit of community within the Wire family. When Wireling Patrick Perez was murdered in a carjacking in Los Angeles in January 1998, the grief online was palpable, and a group of Wirelings attended his funeral to show support to his family. They had had no idea of his online world. If you live in Los Angeles and see "U21REM2" license plates on a car, think of Patrick, because they were his. The birth of Mike and Karen Conways' first child was celebrated online, and the Zoo Baby was showered with Popmart-themed baby outfits. Today the Conways are the proud parents of two teenagers, as well as the custodians of the Wire banner. Wagner is now a professional photographer, and his photos of the Wire era are still available online, a showcase for a bygone time. Imboden looks back on the Wire period as a "wonderful couple of years," despite no longer having any involvement with the U2 community. Those of us privileged to be a part of Wire during its '90s heyday feel a sense of nostalgia for a time when the simple act of opening an email provided a global passport to an international community beyond our wildest imagination. At the dawn of the Internet age, we grew up together, shared our lives, developed friendships and created a truly amazing international community from the comfort of our personal computers. Natalie Baker is a teacher in Melbourne, Australia, who for the past five years has been working on a documentary called Meet Me In The Sound that explores U2's fan culture around the world.